Meanderings and Reflections: Have you spoken to the moon? Have you spoken to the moon? Madness you might say but still many of us do speak to the moon. Maybe because we want a passive listener to whatever we sometimes have to say. People sometimes always try giving solutions or a very understanding look which does not touch the insides but the moon! It is always there just for what it is. It might be a grand fictive exaggeration of the imaginative mind but still it is a comfort talking to the moon. There is an exclusiveness about talking to the moon. It is only the moon and you! Of course I make up the responses of the moon in answer to my questions and that is the special treat we give ourselves. Isn't it. I find this old lullaby very soothing. If you have listened to Jim Brickman's version, it transports one to the world where the only members are the moon and yourself. Lovers like talking to the moon for they associate the moon to be a messenger of love as the same moon is seen by the man and the woman in different parts of the country. I don't know whether lovers still do all this. They might be . . . The moon is sometimes represented as a woman and sometimes as a man in different cultures of the world. There are many legends, myths and wonderful tales about the powers of the moon. Scientists also believe that since the moon consists of a high percentage of water, it has the ability to affect humans who also constitute of 70% of water. When one is sad, we become sadder when we see the moon and the same applies for happiness as well. Whenever I visit any new place which I am not quite familiar with, I wait for the night so that I can sight the moon and feel that I have someone whom I am acquainted with. It is strange how we can associate with inanimate entities like the moon, mountains, trees, stars and water. But somewhere down in my being, I know that they possess life -- not like the one we know but something of a higher order and that moves us. Next time you see the moon, think of me as I would/will see the same moon from my part of the world! A very reflective and spiritual post, Susan, it was a joy to read. The moon is indeed a mysterious and beautiful figure, a symbol of both inconstancy and stability - though it may always change its shape, it always reverts back to its original form. see you soon, in the moon! From a young age, I've loved the moon. When it's new in the sky and I can't see it, I feel as though I miss a close friend. Susan Deborah, sometimes I wish that we were "talking". Your posts are frequently something which have immediacy for me. Example: Last night I was outside, and the moon was attracting a large light--a planet?--to its arms. And indeed I spoke audibly to them both. And I did wonder how many around half of the world were viewing a similar mysterious happening. This--BEFORE I read your post! You write so well, and your topics consistently present themselves to the moment. (I did not know the rhyme, just listened to the Jim Brickman version--I am starting this day the right way. Thank you Susan, again and again! What an awesome post, Susan! The moon has so many different meanings for people, and it's nice to think of it as that single entity that hangs in everybody's night sky... where we all can see it... even if not at the same time. Yes, one can relate at different levels to the moon. Every man has his or her own story of the moon. I am glad you found something in this post dear Sam. Same here. I have always loved the moon. I always look out for it whenever I am outdoors. Take care dear Angie. Your words are always a source of energy and vigour to me. I know. As I said to Sam, the moon can mean so many things to different people and every one has a story of the moon! It has a rich storehouse of myths and legends as well. Ah! the last line is beautiful as when I see the moon, you will not and when you see it, it will be day here. That's the beauty of it all. I amaze at this. What a lovely little poem! It shows the moon as omnipotent; it can see not only me but also someone I wanna see. It happened to me once that I walked home in the late evening, and it was only me and the moon, so I talked to her saying something like: 'You and me, we are friends and you're going to accompany me till I get home and see that nothing bad happens to me on the way'. Your story seems so sweet. I loved the way you have said "You and me, we are friends . . ."
The moon is always very special. Very sweet post Susan! I never knew all the words to that song, I will teach it to my children, who love the moon. I myself am rather attached to it as well. Wishing you a blessed and peaceful moonlit night. Welcome and thanks for the nice words. I liked the wee song in your place today. Loved the lullaby and I never knew such a sweet poem really existed. As a matter of fact I dont directly speak to the moon but I do share a lot things with the moon.It looks a bit strange and funny but some people really have that type of connection with the moon. I liked the way you presented your feelings that, when ever you are in a new place and lonely, you wait for your acquaintance (moon) to feel happy and comfortable. Really moon has that charm. 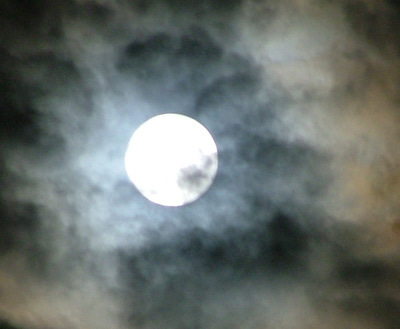 Personally I have always loved the full-moon and its white light. I saw that lullaby in an English film called "Evening." The moon is always a source of delight. I saw it a few minutes ago. Today it is a lovely crescent. I think every culture has a lullaby related to the moon which mothers fondly sing to their children and the song goes on and on to many generations. I see the clouds too and build wee stories out of them. And you shared a nice saying with us. I have never heard that before. Hope your Sunday is unfolding well. WOW! not only form the site but hoe I felt after reading your post. The moon brings out a ray of emotions. Something about the moonlight that makes me want to dance and smile. I'm a Cancerian, and the Moon is my ruler. The Moon is always represented as a woman, and the Sun a man. There are many things affected by the Moon, including the tides of the sea, and Lunatics were at their worst during the full Moon, as were werewolves in mythology. My Grandmother used to sing that song to me as a child, but I had forgotten it! Thank you for the reminder!!!! Ahaaa... talking to the moon.. interesting... I do to.. but to the sky :) Coz I assume, there's a much divine world out there called the heaven with all the good people filled with all the goodness they have. So I sometimes stare at the sky and talk to it endlessly. By talking i even mean pleading, thanking, complaining, sharing and just talking :) Most of the times it makes me feel so good when I let out my thoughts to the sky. Beaming with joy and happiness. Thanks indeed from the depths of my being. Nila, nila odiva . . . remember? Talking is everything included and I am so glad we are kindred spirits in this quality. Thanks for your kind words dear Sukanya. Joy to have you come here. Moon makes me feel different things at different times. I share your feelings about the dolls and such. The quality of the moon that fascinates me is that it is a physical entity but cannot be touched or felt. I guess by it being far, we can relate to it emotionally better. Ah, the sea. I love it as well. Hmmm. Nila, Nila . . . The planet Venus is my ruler but it not would be an exaggeration to say that Venus shares the credits with the moon! Werewolves and myths are quite interesting. I am glad that this post reminded you of the past and its beautiful impressions on your mind. This song has struck to my mind and I find myself humming it always. Glad to see you come by and share your insights. I've stared at the moon a thousand times...and its always calming to gaze at too. Thanks for coming by. The moon is wonderful isn't it? And my toothbrush gently thinks . . . Paralysis and thoughts of love! Every family has its own language . . .